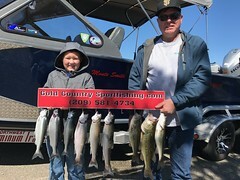 Returning client Bryan brought along his two daughters and dad for a days fishing trip to Don Pedro on Tuesday August the 14th. We met up at the lake, launched the boat and headed out. We had some cloud cover that really made it a great cooler day. After setting four rods all rigged with something different and at different depths we were underway. It wasn’t but only a few minutes when we had our first bite and one of the girls was reeling in the first fish of the day and was soon in the cooler. The two girls ages 9 and 12 took turns reeling in fish not loosing but only one. At one point after going awhile without a bite we had a triple hook-up, so it was a mad scramble and everyone onboard did a great job getting all the fish in, this did not happen only once but twice getting all fish aboard. 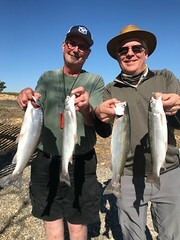 Then around 9:45 we had 14 fish and the sun made its way through the clouds and was beginning to get warm and Bryan said that’s good enough Monte I do not want to burn the girls out. After putting everything away and a few photos we headed for the dock to clean fish. What a great day with great people. Thanks again everyone!!!! 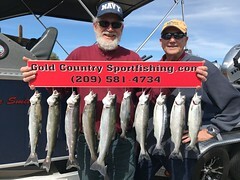 This entry was posted in California, Don Pedro fishing guides, Don Pedro Lake, Gold Country, Gold Country Sport Fishing, King Salmon, Kokanee, Melones, New Melones fishing guides, Rainbows, Trout. Bookmark the permalink.